If you already own a dirt bike you can take advantage of this existing machinery to gain extended usage during the cold snowy seasons. Kit bolts onto your bike with no modifications and fits late model dirt bikes that are 250cc and larger (450cc recommended). The weight is much less than a snowmobile (about 300 pounds with bike), and the narrow compactness translates into a much more maneuverable carving experience for the rider. The narrowness also means increased access to tight areas such as dense forest and traversing steep hillsides, and an easier time digging it out of a snow bank if it comes to that. Its a universal kit, which means you can mix and match with different bikes; and it retains its utility even if you upgrade to another bike or make major modifications to dial the bike in to your own tastes and fitment. 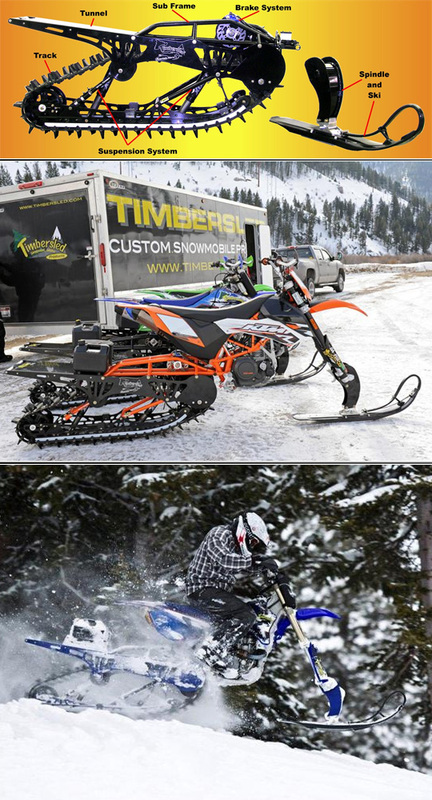 Much less power in a dirt bike engine compared to a snowmobile, and therefore speed, hill climbing, and deep powder performance is significantly decreased. Cargo capacity, passengers, and other utilitarian applications are severely limited, or not possible, with the bike compared to snowmobiles. Efficiency and range are limited, especially in deep snow, which makes the bike conversion more of a toy than a transportation tool. The narrowness means it is unstable on ice, which is problematic on slopes with painful consequences. I think its a nice application of track technology for the recreational crowd, and it serves a niche for dirt bike riders who want to play in the snow without all the size and cost of a snowmobile. It looks like a lot of fun, with softer falls than in the dirt and rocks, too.